Rainbow Skies is an indirect sequel to Rainbow Moon, released in 2012. Rainbow Skies has been in development this whole time, as a small team of five core members has been working to bring you the best strategy-style RPG this indie team can develop. Rainbow Skies follows the tale of Daimon, a young man who lives in the sky, and his friend Layne. When a few mistakes and the cover-up attempted go sour, they fall to the earth and meet a young adventurer named Ashly. Literally bound together by chance, the three head off on a quest to free themselves from a spell that binds them together. As they travel, a much greater adventure awaits. 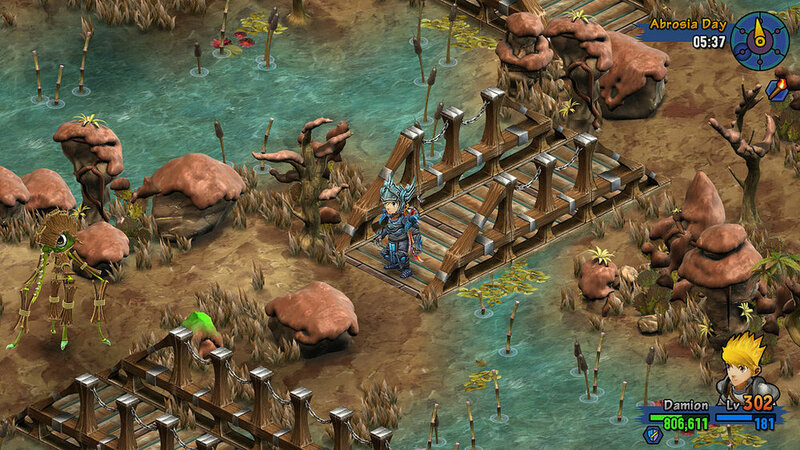 Rainbow Skies plays out like a simpler Final Fantasy Tactics. You have a small party of three prime members. As you go along, you can recruit monsters to your party as well. The game contains all the traditional RPG tropes of upgrading characters, skills, and such, visiting towns, going on quests, et cetera. The developers promise a ton of post-game content for those who want to have a real challenge. Gameplay consists of finding quests and completing them, via exploration of the map or battles. Battles are grid based, and you can learn formations and new powers and spells to help you in battle. Overall, it's a pretty straightforward game, albeit with a few hiccups that bother me in battle. So far as I've noticed, the formations really don't do much unlness you are actively aware of the positions your enemy will be in (such as a story battle you've already lost before). Powerful magic seems to be highly specific. For example, one particular fireball is released to attack enemies in a Knight chess move pattern away from you, no further or closer. Moving takes away an action, so you may not be able to attack unless you take a step back, which takes your attack turn, then the enemy comes a step closer. Plus, aiming after selecting isn't as easy as tilting the stick, you have to press square to cycle through the four directions, which are set up Q-Bert style at angles. If you've played games like that before, you know how you an accidentally hit the wrong angle. FF Tactics let you pick a square and then move, while this moves you step by step. Hit the wrong button and you lose two turn options having to turn around and go back. Many times these mechanics kept me from success. Another feature the game touts as a benefit often hurt as well. Instead of forcing a game over, it would "conveniently" kick you back to the world map with one hit point of health. A game over (with proper saving) would allow you to retry easily, but in this mode you successfully used up all your health potions and money for buying them just a few moments before in battle, so you have to start from square one. A few times I'd have to go struggle through a couple random battles just to get enough cash to revive my team at the nurse. As the game goes on and death is a little less frequent this becomes less of a problem, but at the start it's rather frustrating. Another frustration is item carry limits. You have to physically purchase the "pockets" to specifically hold items or potions. For me this is just one more step of busy work. There were also a few times where a quest giver would say "go kill three of these monsters." They were active and visible in the world map. You could even go talk to them. But the game wants you to defeat them in a specific order. This means if you cruise the maze of the game and locate enemy #3 first, you can't do squat, even though their battle patterns could easily be transposed amongst each other. The game is cute and well designed, but it seems a bit too "boilerplate." Character models are pretty traditional, with a cute art style. The game is a through-and-through fantasy RPG, even the font chosen for the menus looks like something I've seen before. The game gets it's uniquity from it's deep customization. Each character can learn new skills. Their weapons and armor can be upgraded with the right items. There's food management, equipment strengths, and many other statistics to pay attention to. Some of the simplicity of the battle options leave room for desire, as sometimes I couldn't get a move in because Character A needed to walk through where Character B was, but I couldn't move them, even though they were next up. Once you get past the game's difficulties, a fun strategy title shines through. Much like how a chessboard has many different opportunities but you are still stuck with where each piece starts and their overall capabilities, Rainbow Skies asks you to overcome battles with what is placed before you. It's quite enjoyable to finally figure out the right combination, and you can always go out and grind to level your abilities to take down the enemies, though it is a bit of a grind to find the materials needed to level up your characters and weapons appropriately. The game really shines in allowing players to enjoy the game as they see fit, despite the handholding, as you can adjust the "battle rank" to allow more challenge. Enemies become tougher, but the rewards become greater, to the point of unlocking new areas of the map. While it feels frustrating to drop the battle rank when you can't seem to go any further, it does make the game a lot more accessible and feel less like a forced grind fest. Despite the shortcomings, I can still recommend the game to fans of the original or those in the mood to scratch that Final Fantasy Tactics itch. Special thanks to eastasiasoft and Sidequest Studios for providing a cross-play (PS4/Vita) copy of the game for review!